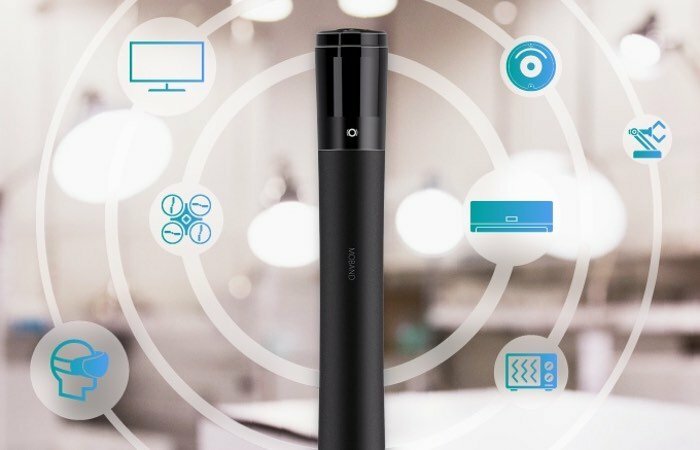 iWave has created a new remote wand which has been designed to provide a universal remote control takes the form of the aptly named Moband which is equipped with a small OLED screen to help you select the device you’d like to control. MobandHas this week launched by Kickstarter with the aim of raising $60,000 over the next 40 or so days to make the jump into manufacture. Watch the video below to learn more about this universal remotes features and functionality. Monad can be used to control a wide variety of different devices and can be used at both home and work to control appliances, applications, computers and televisions. The development team at iWave explain a little more about its inspiration and design. Moband is preinstalled with a code library for most major brand home appliances. With a simple press of one button on your traditional remote, Moband will automatically identify the model of the appliance and the configuration is done. Moband has 10 preset default motions: flick hard, flick up, flick down, flick left, flick right, push forward,pull back, twist clockwise, twist counter clockwise. Moband is capable to learn NEW MOTIONS. Just define your motions and save them into your Moband , then you can use your new motion to control, it’s easy! For example, define a ‘heart shape’ to turn off the TV while turn on the CD player, enjoy your home-theatre with your family at the same time. How sweet is that? The device’s name will appear on the OLED screen, telling you know which device the Moband is currently controlling. The touchpad provides you device selection and the possibilities of defining your own motions. With the combination of the screen and touchpad, you will able to add up to 15 devices to your Moband! Jump over to Kickstarter to make a pledge from $129 for early bird backers with delivery expected to take place sometime during December 2016.